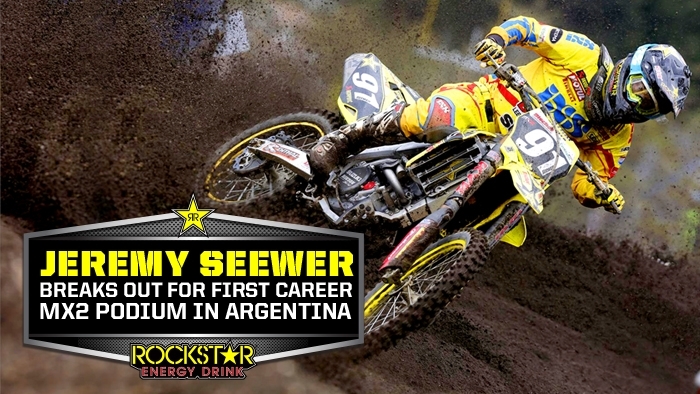 The Grand Prix of Argentina throbbed and heaved with 30,000 spectators excitedly packed into the confines of the new racing circuit near Villa La Angostura and Rockstar Energy Suzuki Europe’s Jeremy Seewer scored a memorable third position overall in the MX2 class for what was the third round of 18 in the 2015 FIM Motocross World Championship. In just his second GP season, and first as a full-time professional, Seewer took the RM-Z250 to fifth position in both today’s motos to walk the final step of the podium and spray GP champagne for the first time. Team-mate Glenn Coldenhoff made good progress on his RM-Z450 in the MXGP category with 10th overall and a season-best classification of eighth in the second race. Dark, sandy volcanic earth provided a difficult test at the freshly-built track. While the layout was quick and jumpy, the ground was a mix of shifting bumps and a solid base that meant traction varied. The course was hard to judge through the various sections but the facility was undoubtedly world championship-class and fans lined the fences and packed into the enclosures that flanked the corners for the best view. Seewer was on the pace of the top-five in MX2 from Saturday and ran to a solid sixth position in the qualification heat. Adapting to the irregular ground but enjoying a course that provided line choice and passing opportunities, the Swiss chased Julien Lieber for most of the first moto on Sunday and equalled his best GP finish with fifth place by the time of the chequered flag. In the second race he was set for a top-four result after trailing eventual winner Dylan Ferrandis for many laps but just could not withhold the challenge from Tim Gajser in the final two circulations and again ranked fifth. The points’ tally of 32 from both sprints was enough for Seewer and the team to start celebrating. After his disappointment with illness and heat exhaustion in Thailand three weeks ago this was a positive re-entry to the upper section of the standings for ‘#91’. Glenn Coldenhoff is almost back to full fitness after recovering from his broken toes – an injury he re-aggravated in Thailand – and drilled the RM-Z450 to a scorecard of 14-8 in only his third MXGP event. The premier class rookie needed the first moto to get in sync with the bumps and demands of the Neuquen terrain but was much more positive and reactive in the second race and benefitted from a brighter first lap nearer the head of the pack. The former MX2 Grand Prix winner circulated with Romain Febvre and then with Gautier Paulin and his eighth place was a smile-inducing forward step in his MXGP class education. Rockstar Energy Suzuki Europe will next be on international duty at Arco di Trento in northern Italy on April 18-19th for the Grand Prix of Trentino.